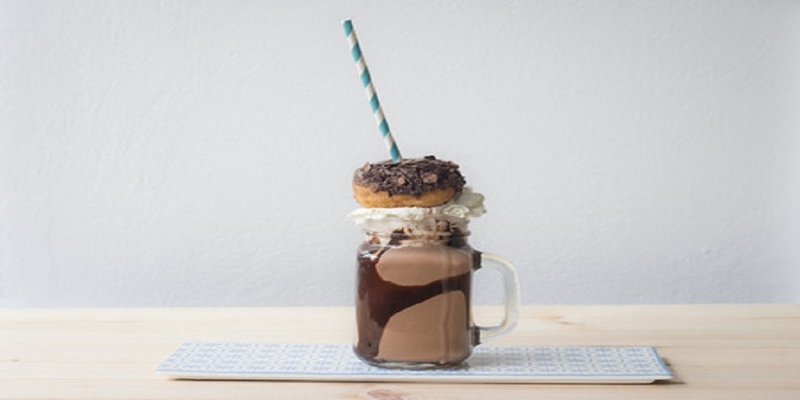 Just recently, there has been a new rise of a mega milkshake madness called FREAKSHAKE which is gradually taking over cities in Australia like a storm after originating from a cafe in Canberra. This time, the trend is mostly driven not by fast foods, but by local cafes. People drive long distances just to get a taste of this, not having in mind the large amounts of kilojoules which would be injected straight into their diet. But, who would not want to have a well-prepared milkshake? There is certainly everything to like- ice cream, creamy milk, and in most cases with your favorite flavors in an ice cold drink which offers between not less than 1200-1500 kilojoules in just a serve together with 5-10 spoons of granulated sugar and almost or more than15g of fat. The addition of a doughnut would sound like a very brilliant and delightful idea. But hey! That escalates the kilojoules up to another 500-700 in just one serve together with an addition of 2-4 spoons of sugar. But we have not yet gotten to the ultimate version of the milkshake. Some other outlets tend to add gelato, cream, pastry, and Nutella to their milkshakes. The seriousness as regards to the overconsumption of these highly indulgent latest freakshakes, most times is justified by one having in mind that the shake is just a one-time treat. For those who are fans of these mega shakes, below is an example of a well-known freakshake you could grab out there. But please be aware that an average human being should take in on average, 8700 kilojoules per day, but the fact remains that these freakshake to be mentioned could contain more than the average amount for one person, and so, I would like to apologize in advance. The mixture of a Bourbon cream that is whipped, with maple bacon, together with maple syrup and puff pastry could just be referred to as heart attack well prepared and stationed, lying in wait to occur. Now, with just a decent quantity of fat that is saturated given that it is not really low-fat milk, reduced fat or lean bacon with puff pastry are the major ingredients. For this lovely and great treat you would be getting close to 4000 kilojoules or half of your intake on a daily basis of at least 80 grams of fat and 20 grams of sugar. With the above and many more, would you ever want to try one of these? My best guess is yes, who would not want a perfect milkshake, I mean FREAKSHAKE on a perfect hot afternoon?